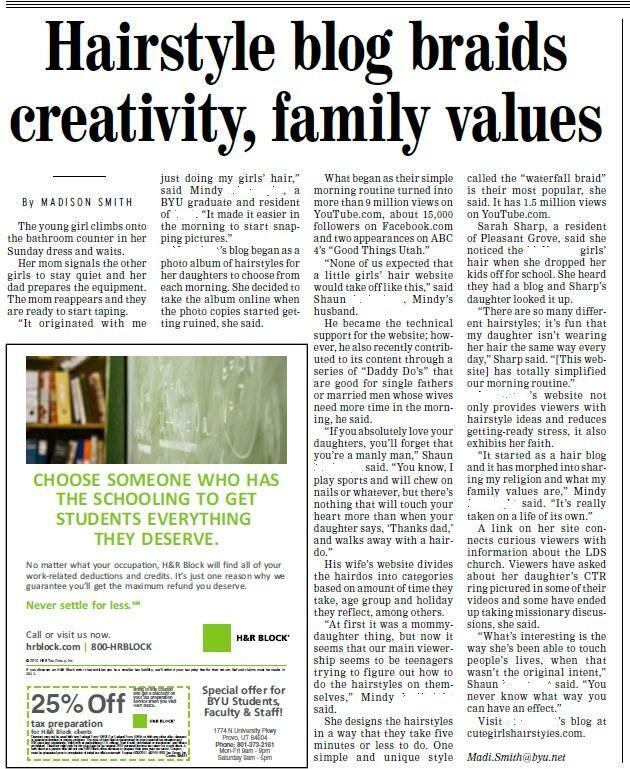 A few weeks ago I was called by a reporter from the Daily Universe, BYU’s student newspaper, asking to do a feature write-up on our website. I was nervous, of course, because I always fear that I will say something lame and look or sound like a babbling mess! The newspaper has a circulation of over 36,000 readers, so we welcome any new followers to our site and hope you enjoy what you find here! Since this is a student newspaper, I am sure many of the girls on campus will be using these styles on their nieces or adapting the hairstyles to themselves! The reporter had several questions about how and why we started the site, how popular it has become, how my daughters and I sucked my husband into becoming involved, etc. She also noticed I openly state my religious affiliation on the website, to which I replied that I get several emails monthly asking to know more about my beliefs and family values. Overall, I think the reporter did a fabulous job of showing how our site has helped so many moms and daughter’s worldwide. (One always worries about being misquoted anytime they are dealing with the press.) I also feel that the article accurately depicts how this “accidental” project of mine has really become a family affair. I just want to thank all of you followers for helping make this website what it has become! You are awesome! Now, many of you viewers write in all the time to compliment me on my family, so I just want to also share here… on my very public blog… that I think my family is great as well!